Thursday, November 1st, 2018 at 2:30pm. Wednesday, October 31st, 2018 at 1:37pm. We invite you to discover The Meridian, a collection of 81 beachfront residences spanning an impressive 550' of pristine Perdido Key beach. 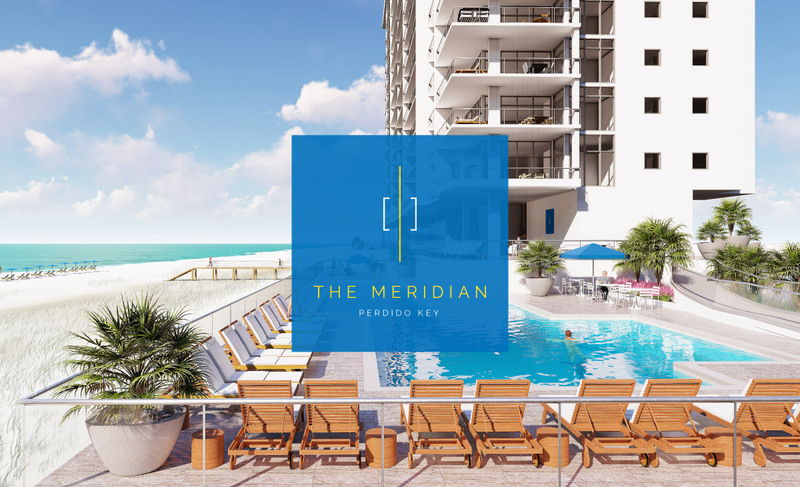 With over 20 residences reserved in just one week, The Meridian is the Florida Gulf Coast's hottest pre-construction offering. Featuring 3-, 4- & 5-bedroom layouts offered from $885,000, this opportunity will not last long. Wednesday, May 23rd, 2018 at 12:48pm. w/ Realty 1st from the beautiful white sand beaches of Gulf Shores AL! Summertime is here! Are you ready to enjoy it fully with your own slice of paradise? If not, contact me right away to get in before prices rise more! (251) 979-1098 or matthew@orangebeach.tv. This mornings sunrise in Gulf Shores AL was absolutely amazing! It was so trivial as to whether I should leave or not! Monday through Friday at sunrise I get out on the beach and check out the Wind, the Water, the Weather, and the Waves. I do this via Facebook live! It is so interesting to witness the changing scenery daily. The waves are rough one day and calm the next. The wind is blowing a gale one day and none the next. The weather is beautiful one day and still beautiful the next day! haha! The water is clear one day and may have sealife the next! It truly is amazing being blessed to see this part of the country daily! Saturday, January 27th, 2018 at 3:28pm. I've been a licensed Real Estate Agent since January of 2012 and over the last 6 years, the prices of AL Gulf Coast Real Estate has been on a consistent climb with no topping out foreseen. The graph of Inventory Levels* are the lowest since 2006 with ~650 units for sale in December 2017 compared to an astounding 2,904 in December of 2006! With the low inventory environment, this brings about reduced days on market as buyers are ready and waiting to pounce when the condo hits the market fitting their personal criteria. The Average Days On Market(DOM)* for AL Coastal condos is nearly half from one year ago; around 87 days. Monday, November 13th, 2017 at 5:59pm. In our market, if a buyer desires a gulf front, 4 bedroom, rent-restricted condo then you'll be spending your time in Perdido Key FL. A rent-restricted condo is a tower that which restricts the minimum days of rental. For example, the minimal rental period for a great amount of these units is 30 days. Therefore, if you desire to rent, you'll have to pick up the tab for at least 30 days. Perdido Key attracts a lot of buyers who do not desire vacation rental income. These 4 bedroom condos in Perdido Key FL are mostly 2,000 sf+ and have 4 or more bathrooms. Additionally, the majority of these residences are "low density", meaning the footprint is small and offer limited amenities. Thursday, November 9th, 2017 at 4:22pm. The above graph represents the average sales history of direct gulf view 2 bedroom condos from 2010 to current. I find it really interesting the price consistency since 2010 with the exception of 2014 to 2015 revealing a ~$26,500 jump in average price! My personal opinion of price next year is a jump much like in 2014-2015 because of the low inventory environment we're currently in. I expect fewer sales but at much higher prices. Thursday, October 26th, 2017 at 1:33pm. The Orange Beach "Sister Buildings" is comprised of the 7 buildings above and one not pictured(Romar House). However, for this blog post we'll be focusing on the towers with the red arrows below. These are Windward Pointe, Pelican Pointe, White Caps, Bluewater, and the last two towers, Summer House on Romar Beach. We will be focusing on these only because the square footages are nearly the same amongst all the condominiums. We will not include The Sands at Romar Beach and Romar House in our discussion because The Sands is a rent-restricted tower and the square footage is 1,943. Additionally, Romar House is 1,683 square feet which is significantly larger than the condos with red arrows above. Wednesday, February 15th, 2017 at 1:29pm. Tuesday, February 14th, 2017 at 5:31pm. Matthew J Welch w/ Realty 1st and www.orangebeach.tv brings you along to see this Valentine Day's beautiful sunrise! Contact me to purchase a beautiful condo to go along with this beautiful sunrise!